Our talk with Dr. Tennant is one of the more curious and fascinating shows we’ve done on the world of health. Dr. Tennant also paints a clear picuture of just why and how dental pathology is project one for us all. 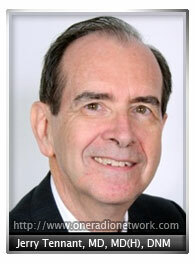 Dr. Jerry Tennant is founder and director of the Tennant Institute of Integrative Medicine in Dallas, Texas. Educated at Harvard University, he is a diplomat of the Academy of Ophthalmology and the Society of Ophthalmic Plastic Surgery. He has over 15 years practice in energetic medicine, treating thousands of terminally ill patients. He lectures on Integrative Medicine, is the author of several books, and has several patents and others pending. Close to half of all adults living in the U.S. suffer from at least one form of chronic disease. Have you ever wondered why, just a few generations ago, conditions such as heart disease, cancer, stroke, diabetes, etc., were nearly unknown? What has changed in our lives to make us so vulnerable to chronic diseases? Perhaps more importantly, what can we do to restore and/or protect our health?